Global NFC Chips Market – Industry Analysis and Forecast (2018-2026) –By Storage Capacity, Application, End User, and Region. Home » Reports » Electronics » Global NFC Chips Market – Industry Analysis and Forecast (2018-2026) –By Storage Capacity, Application, End User, and Region. Global NFC Chips market was valued US$ 2.802 Bn in 2017 and is expected to reach US$ 20.12 Bn by 2026, at a CAGR of 24.49 % during a forecast period. NFC Chips is anticipated to witness a tremendous grow during forecasting period and accounted for versatility and convenience. These chips also provides enhancement towards safety. The growing need for secure dealing can be felt worldwide and thus boost the growth of the NFC chips market. Based on application, Smartphones sector is expected to grow during the forecast period due to their ability to provide safe transfer of data wirelessly, fast connectivity to mobile peripherals such as wireless speakers, smart TVs, safe mobile payments and others. Further, research and development and technological advancements in near field communication chips enabled, Smartphones has also provided an impetus to the growth of NFC chips in Smartphones. Growing popularity in end-user industries such as medical, retail, automotive, and aviation among others coupled with healthy economic growth of emerging economies are offering potential growth opportunities to the global NFC chip market. NFC chips have been extensively used in healthcare sector such as NFC for heart monitoring devices, NFC based diabetes monitoring system, medical implants, and medical data storage devices among others are expected to gain popularity across several end user applications is set to boost the market growth in the forecasting years. There is a need for reliable and efficiency mode of information sharing and this is driving the adoption of NFC chips. The essential faster access to data across industries is also a key factor behind the growing popularity of near field communication technology. The growing investments and advancements by players within the market are expected to help the market to grow within the forecast period. The decreasing rates of NFC chips on account of the declining prices of various materials required for the manufacturing of these chips will make it very lucrative for NFC market players. The increasing adoption of online payments is another key factor boosting the growth of this market. With increasing adoption of NFC Chips, challenges have been introduced in the market. Rising data privacy and security concerns, complexity related to the product designing, easy availability of substitutes, lack of interoperability, such as Bluetooth, WI-Fi, ZigBee, lack of public awareness regarding the use of NFC and higher cost of NFC chips are some major issues which further profoundly pull back the NFC Chips market. 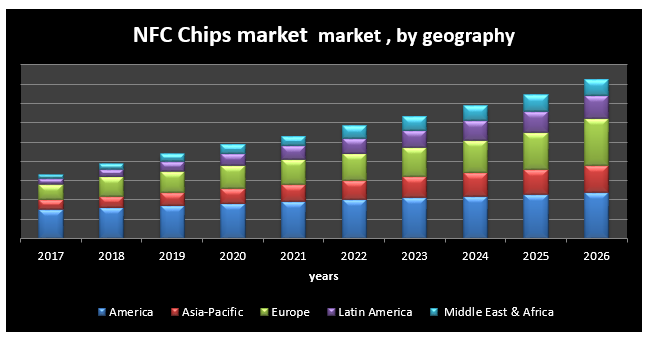 Geographically, The North America market is expected to be leading contributor to the global NFC Chips market and accounted for 34% of the market in 2015. The key factor behind the growth of this market in North America is the partnerships between enterprises and banks, which is helping in tokenizing the cards that use NFC chips. However, it is Asia Pacific which will emerge as the leading market for NFC chips in near future. The Asia Pacific NFC chips market is expected to expand at 27.90% CAGR approx between the forecasting periods and accounted of the growing penetration or use of smart phones in the region. Key players operating in the global NFC Chips market are MS AG, STMicroelectronics, Qualcomm Inc., Texas Instrument, Broadcom Corp., Identium, Stl, ACR, Attendance, Mantra, NXP Semiconductor, AMS AG, Sony Corporation, Oberthur Technologies, Mastercard, Nokia Corporation, Identive Group Inc., Gemalto NV, Renesas, American Express Company, and AT & T Inc.
• AT & T Inc.
15.3.22. AT & T Inc.